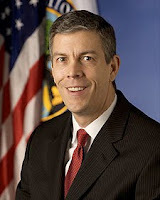 Journal On Latino Americans: Education Secretary Duncan calls DREAM Act "Common Sense"
Education Secretary Duncan calls DREAM Act "Common Sense"
DREAM Act will open the doors of higher education to those individuals who were brought to American by their parents as undocumented children. WASHINGTON -- U.S. Secretary of Education Arne Duncan told Congress today that the Administration supports passage of the Development, Relief, and Education for Alien Minors Act, or DREAM Act, for two basic reasons: it’s crucial for meeting our national goals and future workforce needs, and also sends the right message about the value of hard work and our Nation’s basic sense of fairness. The DREAM Act, which creates opportunities for young people to attend college or serve in the military even though they don’t have documentation, requires a rigorous process to qualify: they must prove they came to the United States before the age of 16, have lived here for at least five years, graduated from high school or received a GED, possess good moral character, and been admitted to an institution of higher education or to serve in the military. Only once they’re in college or serving in the armed forces will they have the chance to earn a legal status. “These are demanding standards that demonstrate academic achievement and personal integrity,” Duncan said. It is estimated that each year, 65,000 young people graduate from high school in the U.S. and find themselves unable to work, join the military or go to college because of their immigration status. Approximately 800,000 young people would be eligible for the DREAM Act upon passage. Duncan discussed the DREAM Act in relation to the President’s 2020 goal for America to once again be the country with the highest proportion of college graduates, pointing out that students served by the DREAM Act will help grow our workforce and fill shortages in STEM jobs and other high-demand fields. He called higher education “an economic growth engine and a ticket to a middle-class lifestyle,” and outlined the many benefits of attending college, including higher earnings and by extension, tax revenue; lower unemployment, and greater likelihood to vote and do volunteer work. In his testimony, Duncan also dispelled several misconceptions about the DREAM Act: it does not create an amnesty program with an easy path to citizenship; it will not affect the availability of federal student loans or Pell Grants for citizens, or create incentives for an increase in undocumented immigration. Labels: Arn Duncan, Dream Act, Education Secretary, IMMIGRANTS IN THE U.S.